Shipping Weight: 1000 units at 35.3 lbs. What sets this twist pen apart from others in its category? Why, that would be the stylus feature on the opposite end! 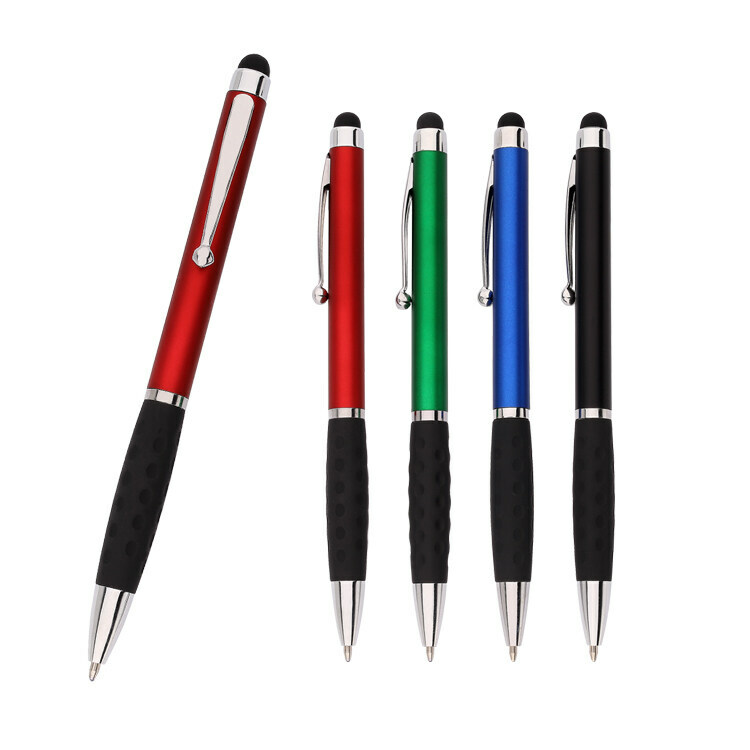 Thanks to the insanely low sale price of Stylus Grip Pens (Colors), you can order some to drum up new business and still have some left over for gifts (and for yourself). Styluses are pretty neat. Go ahead and try to use your current twisty pen to push virtual buttons on your touch-screen device. You can't do it, can you? Yeah, we knew that could happen. It's not that we doubted you, it's just that you'd need a special tip to make that work. That's where the stylus tip on the end of this custom pen comes in! 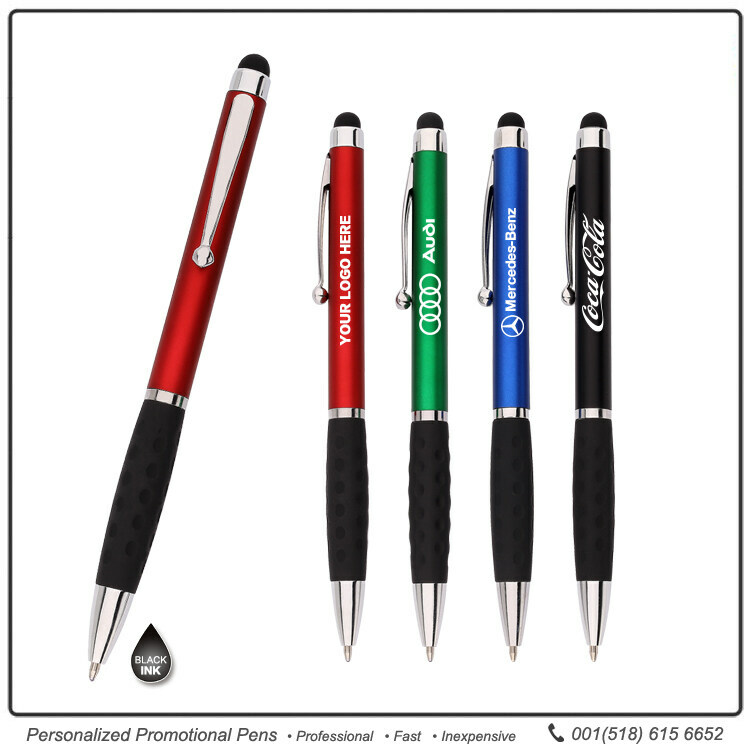 • The pen has a rubber grip with divots that create a non-slip surface. • The pen creates a dark, solid black line that can smudge if the ink is not given a few seconds to dry. • The twist-action retractable tip snaps into place with an audible click. 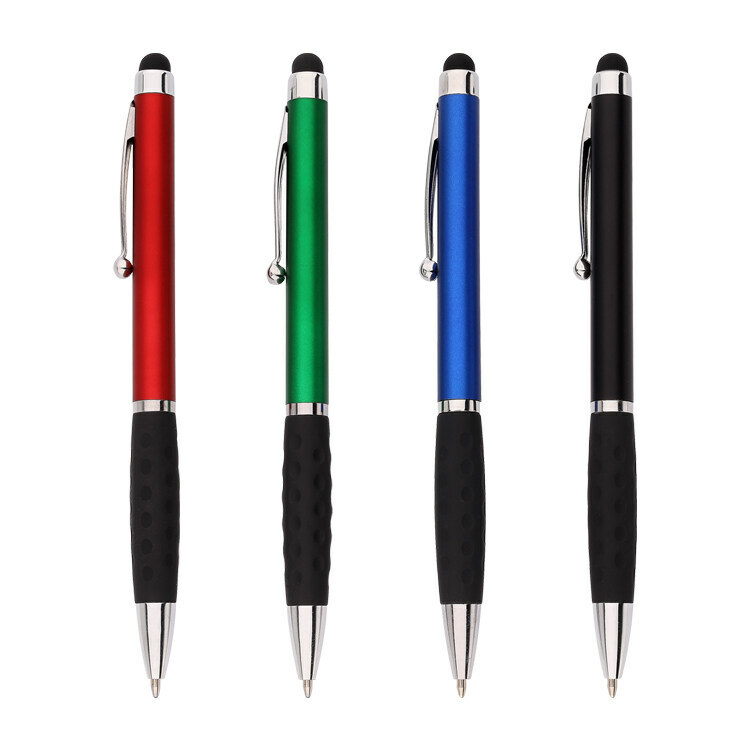 • The soft, squishy stylus tip is gentle on touch screens but still accurate for typing and swiping. Switch between surfing the web, downloading apps, and hand-writing notes with a single promo item: the one you see pictured above. Twist the barrel to use the medium-point black or blue ink, and then just flip it over to use the nub end as a handy little stylus. 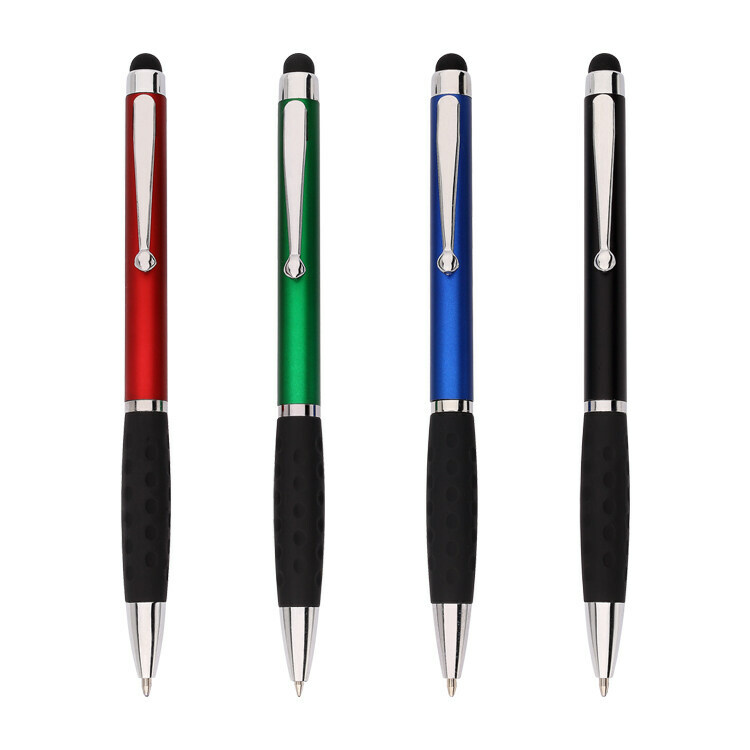 Select your favorite from the available colors and contact JAVLEINPEN.COM to get started on the customization process! We'll make sure your touch screen is smear-free, and we'll ensure your next promotion goes off without any smudges, too. We give these to our customers and they love them! The stylus is a definite bonus on these already great pesn. I order several thousand a year and we are never disappointed! They came out great, kept in contact with me throughout the process to get a design that works best for me. Good service, nice logo and great looking pen. Our clients and staff are all very impressed. We will order more! I had my company logo and wanted my personal information added to it. 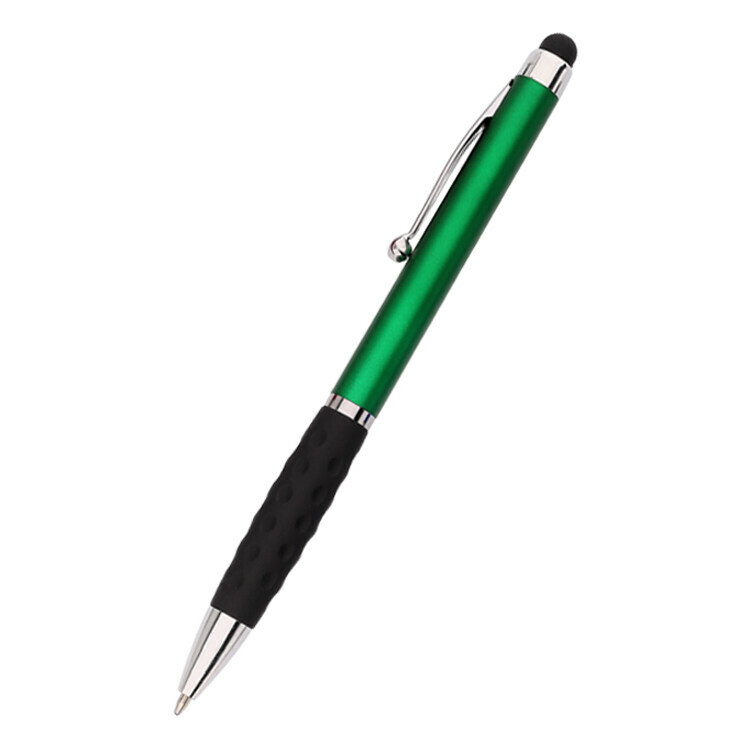 JAVLINPEN designed it, and it looks great. So far so good. Easy writing. Hasn't broken down like some promotional pens do. The cost was extremely cheap, quality was excellent, my clients were all pleased with this. Quality of imprint was excellent. there isn't anything I like least about it. I think it is beautiful, I liked that. Ordered 500 of these for my company and they were just as i pictured. Our logo looks fantastic on them and they turned out great! Very pleased with my order.